With three bands playing Glasgow’s O2 ABC2 and Gary Numan playing upstairs in the bigger room and with half an hour before doors open, there’s a buzz of activity in the venue. As The Swamp Born Assassins sound-check, myself and Richard Young get a chance to catch up, having interviewed him last year. Just like last time, I’m hit instantly by how warm and friendly he is as a person and a wry smile never far away. 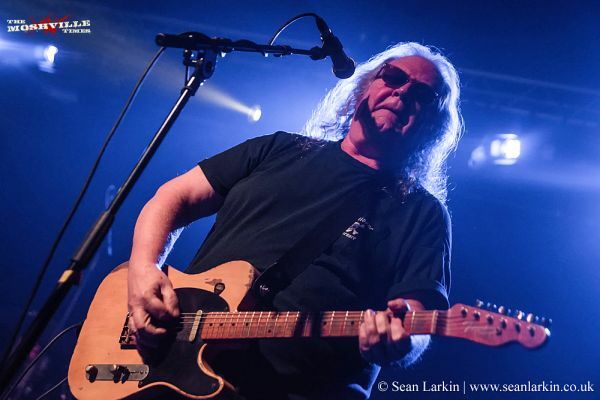 We speak of how this UK tour differs from last year, good causes and the bond The Kentucky Headhunters and Bad Touch have formed – which is certainly evident by the end of the night. Welcome back to Glasgow! Like last year, Glasgow is the last night of the tour. How’s it been? Overwhelming! What we noticed last time, we played Ramblin’ Man with the boys [Black Stone Cherry] and that was the catalyst for the whole thing. We played the SummerTyne Festival in Newcastle, the big bike rally – Pentrich Rock & Blues Custom Show. So we hit all three genres with the folky music, the kinda country music and the more metal crowd. Then we had five other club shows – this being one of them. 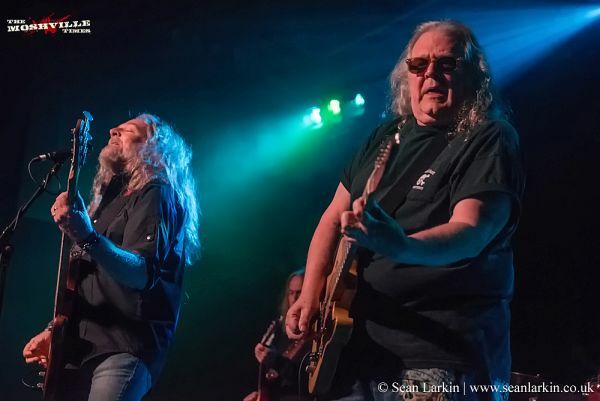 What I noticed, by playing Ramblin’ Man, we gained a whole lot of recognition – people were coming out the second time to see us. The crowds have definitely grown from last year. The first time, it was people observing us – we were a white tiger because we’d never been over here. And then they’d been listening to our music over the year so they were all riled up and ready – they knew the music. By no means was the last tour not a lot of fun; it was. To open for Black Stone Cherry on the main stage at Ramblin’ Man and then watch your kids… they’re big in America but to see what they’ve achieve in Europe and the UK, it’s pretty amazing. Obviously, last year was the band’s first time in the UK. Did you expect to be back so soon? We didn’t really know. I think the bug bit us. I’m still weary of flying but I’m so much better than I was. I think when we left here and got home and after a couple of months, the bug had bitten us and we started itchin’ to come back. We said this is something we should do for the people who like our music but also for us. You can’t expect people to know about you when you’re out of sight and out of mind. When we came over the first time, the blues album, Meet Me in Bluesland had gone to number 1 on Billboard in the States and people were very aware of it and Paul Jones was starting to play some of it in small increments. Our new album [On Safari] took a year of touring time after we left here for that album to sink in. So when we got back over here, people knew the songs this time! I think they did some research and looked back on some of the older albums because last time we were here, it was clear they did not know some of our earlier music. They were more informed on the newer stuff. Black Stone Cherry’s Black to Blues has gone to number 1 on Billboard in America this week. So that gives our clan two number 1 albums on Billboard. It was neat to come over and have people observe but we had to prove ourselves. Now they’re aware of the band, more people are coming out, word of mouth; telling people about it. Another thing I noticed was the press, both online and print and radio, people are more aware of us. The crowd we played to and cultivated and to see it’s grown – that’s pretty positive. Coming over this time, as far as the vibe is concerned, people are more aggressive; they’re more into it. They know what we are and what we’re about. Instead of not know what’s coming from us – they’re expecting it which is a huge difference. Like, if you had a hit song on the radio and you didn’t play it, people would be waiting for it and be real disappointed. That’s probably the best thing. The first time was great for people to observe us like a gorilla in a cage or something. This time, they came because they knew about us and enjoyed us. Last time Bad Touch were supporting, was it just natural to tour with them again? Yeah! We’re so proud of those boys. The Headhunters are coming up on 50 years in January and we have a knack for spotting bands that have potential. So when the boys played with us last year, they were really good, I’d like to think we coached them a lot in the week and a half last year in the down-time; teaching them things, how to work on things and their amps and their vocals and harmonies. Wow! We came over this time and now the old men have to turn up the steam a little bit! Last year we were like “That was great, boys!” And now this year: “Uh-oh, we gotta crank it up now!” They’ve really gotten good and we’re proud of them. If we had more time we’d be hanging out on our days off but when they’re around, they’re like our little brothers. A lot of people questioned why we were having the same opening band. I’ll be frank; I don’t know anyone who could be a better fit as far as the overall line-up goes. With us coming over – older guys – we definitely ain’t going to be promoting prima donnas to have on tour with us. They’re hard working guys. I understand you’re set to play the “other” Glasgow in a couple of weeks for a charity benefit gig. Can you tell us how that came about? That’s two-fold. My son, John Fred, they’re going to have their second child between the 26th and the 31st October. My wife explained to me I didn’t need to be on the road that week; far off. I needed to be home for that. I decided since we hadn’t done anything since the Johnnie record, this would be a good time to do it and in the back of my mind, I’d be a mile from the hospital. There an organisation called The Center For Courageous Kids in Scottsville, Kentucky. They have this huge operation for children with childhood diseases, some with diabetes, crippling diseases, even cancer. They have a base you can go to for a week, like a camp; they ride horses, shoot a bow and arrow, play basketball. They do things they wouldn’t ordinarily get to do otherwise or things that are expensive that maybe the parents can’t do like help with doctor and hospital bills. My wife told me about them and I initiated it. This is an awareness thing. It’s ironic that I wanted to do it to stay home see the baby being born but it turns out we’re doing something for children as well. And the boys from Black Stone Cherry are home so they’ll probably jam with us. What else has the band got planned? We actually recorded live here a little bit. We’ve got about six or eight more shows to do and in the second week of November, I stop. That’s deer season, that’s my break from the band and get in the woods and think “What’s next?” Because we did record, we’ll be in the studio to mix those recordings so you can look for some sort of release from that. Could you see the band going to mainland Europe in future? The circumstances have to be right for us to do it. We’re so much more established in Northern America, that’s where we make our living. It’s not about making money coming over here; it’s about reliving our childhoods as we always wanted to play in the UK.